Lynx Fever, gets you into the Samba spirit with Brazilian Hot Mud and Red Dragonfruit extract. 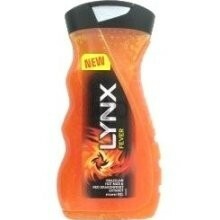 Lynx Fever, get warmed up for action! Aqua, Sodium Laureth Sulfate, Acrylates Copolymer, Cocamidopropyl Betaine, Cocamide MEA, Parfum, Hylocereus Undatus Fruit Extract, Kaolin, Ascorbic Acid, Glycerin, Sorbitol, Propylene Glycol, Mica, Tin Oxide, Hydrated Silica, Sodium Chloride, PPG-12, Disodium EDTA, Sodium Hydroxide, Citric Acid, Methylparaben, Potassium Sorbate, Sodium Benzoate, DMDM Hydantoin, Limonene, CI 19140, CI 73360, CI77891. The second you open this shower gel you have a blast of citrus zing!. It's like a super tangerine smell. Its refreshing and totally lifts the senses. It lathers well, even has exfoliating particles to get that allover invigorating shower.Skin feels really clean and fresh. It is aimed at the male market, but so worth a try due to it scent & exfoliating. Its definitely worth a purchase. You will always find a deal on Lynx in the high street. Great shower gel from a high profile brand. Another scent in a long list of popular bathroom must haves. Lovely refreshing scent that lasts on the skin. Exfoliating and cleansing at the same time and leaves the skin feeling cleansed and soft. Quite a fruity and citrus scent that is really invograting and my partner loves it. Bright orange which is really vivid and lathers up really well cleansing the skin. Perfect for mornings as it is good for waking up with. Orange, Spice & Very Nice!! This is a great gel from Lynx and has a rather attractive almost fluorescent orange colour! The first thing that we noticed is hat this gel has exfoliating particles suspended in the gel. We have to assume that this is the Brazilian hot mud?? Never the less it does exfoliate the skin nicely. The gel has a thick texture and the fragrance is distinctly oranges with a little exotic masculine hint of spice. As with all Lynx gels it lathers brilliantly and cleanses the skin well without irritation. "The second you open this shower gel you have a blast of citrus zing!. It's like a super tangerine smell. Its refreshing and totally lifts..."